Las Vegas, NV, NAB 2018 — With Dante AoIP getting more and more leverage in today’s broadcast environment, the need for easy and flexible control of audio routing and signal flow is increasingly relevant and more challenging than ever. 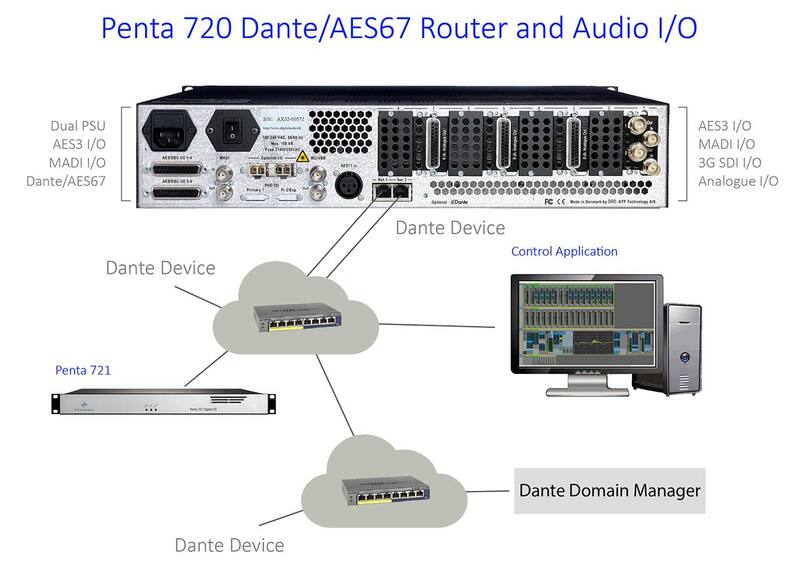 At NAB 2018, NTP Technology is introducing advanced routing solutions with its new Dante/AES67 Penta 720 and Penta 721 audio routing interfaces. These new rackmount units allow more Dante channels and provide full compliance with the new Dante Domain Manager software for management of multiple network domains and IP subnets. Visit Booth C6046 for full demos by NTP and US distributor plus24. NTP’s new Penta 720 is a 2U modular audio interface with a variety of analog and digital interface options. The units have dual power supplies and support hot swap of the 8 configurable interface cards. The new Penta 721 is a 1U digital only unit, with dual power supplies, that can be configured with various build-in options. With NTP’s new Penta units, broadcasters can manage and route Dante channels with greater speed and simpler functionality using the DADman control software, the NTP VMC database driven control system, or a third party system via the Probel SW-P-08 control protocol. With increased focus on network security in today’s broadcast environments, location trucks, and performance venues, access to AoIP control can now be restricted for typical users and the network can be pin-locked via Audinate’s Dante controller. There is a distinct advantage in using NTP’s Penta system as the routing matrix, because all relevant input and outputs are easily accessible for routing, as well as summing in the Penta summing matrix. NTP innovative routing solution configures all Dante channels according to the need for fixed connectivity and IP tielines, and then uses that matrix on the Penta for the dynamic routing. In cases where multiple subnets are a part of the network configuration, the Dante Domain Manager can be used for bridging audio between subnets and also distribute PTP clock information. Domains can be set up to target defined groups of units across the network, and within the domains a Penta can be used for routing as well as audio I/O.